Who could forget Peter Pan’s famous response in the marvelous story by James Matthew Barrie, which is still read today all over the world? 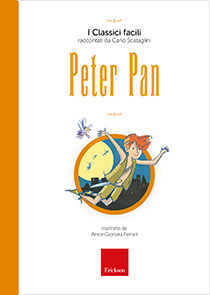 The adventures of Peter Pan, the child who doesn’t want to grow up, Wendy, Captain Hook and all the other strange characters on the island of Neverland are told here in a simplified version, to facilitate reading, along with poetic images. 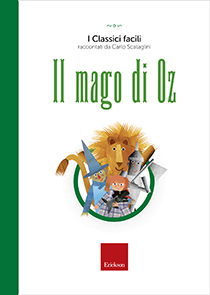 The books in the «Easy Classics» series re-present literary classics for children, with simplifications which help children to read and understand by themselves. Visual support – the text contains visual support, amongst which: a picture at the start of each chapter which recalls the illustrated index, pictures of any new characters in that chapter, highlighting in bold font of new characters in the story. Lexis: basic vocabulary is used and difficult words and idioms in each chapter are highlighted in two different colours, with their meanings given at the end. Syntax: the text is made up of short phrases and simple subordinate and coordinate clauses, subjects are made explicit as far as possible and affirmative, active verb forms are used, with the indicative mood predominating. Organisation of contents: at the start of the book there is an illustrated index of the chapters, whilst at the start of each chapter summaries of the events which happened in the previous chapter and the events which are about to happen are given. Audio: the reader can listen to (and follow) the text of the story told by a narrator, by using the QR-codes found at the beginning of each chapter or from Online resources on the Erickson site, by entering the access code given on the last page of the book. 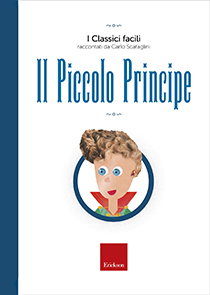 The Easy Classics told by Carlo Scataglini is a new Erickson series which renders literary classics for children suitable for all, thanks to a series of simplifications which help children to read and understand the stories. 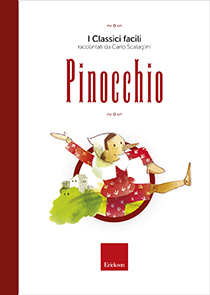 «Amongst the literary classics for children and teenagers are several masterpieces which have inspired and brought together older and younger generations. They are wonderful, timeless stories for all ages and they belong to everyone. I thought that facilitating and simplifying the most well-known stories could make reading as independent as possible». 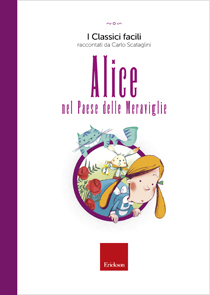 Each book of the series “Easy Classics” is enriched with several beautiful illustrations that are reproduced, title by title, also in the series “Classic Tales with AAC”), so that the books of the two series can be used by children with different needs in the same class context, leading to a more inclusive perspective. Visual support: the text contains visual support, amongst which you can find: a picture at the beginning of each chapter which recalls the illustrated index, pictures of all the characters in that chapter, together with the new characters in the story (highlighted in bold font). Lexis: a basic/simple vocabulary is used and difficult words and idioms of each chapter are highlighted in two different colors, with their meanings explained at the end. Syntax: the text is made up of short sentences and simple subordinate and coordinate clauses, subjects are made explicit as far as possible and affirmative, active verb forms are used, with the indicative mood predominating. Organisation of contents: an illustrated index of the chapters at the beginning of the book, whilst at the beginning of each chapter readers are provided with summaries of the events which happened in the previous chapter and with the ones which are about to happen. Audio: the reader can listen to (and follow) the text of the story told by a narrator, by using the QR-codes available at the beginning of each chapter or as online resources, by entering the access code given in the last page of the book.